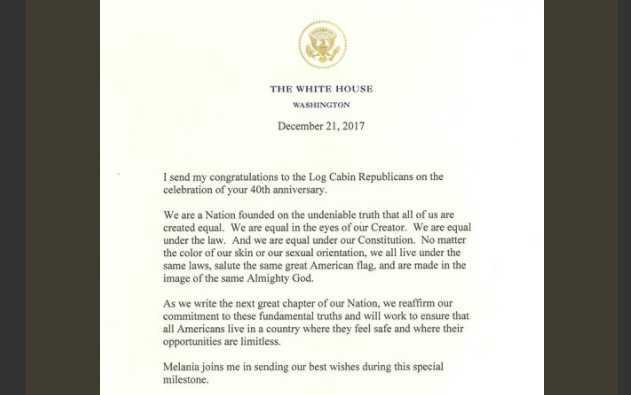 “I send my congratulations to the Log Cabin Republicans on the celebration of your 40th anniversary,” the letter, most likely written by White House staffers, reads. The correspondence further asserts that no matter one’s “sexual orientation,” they are all still made in the image of God. “No matter the color of our skin or our sexual orientation, we all live under the same laws, salute the same great American flag, and are made in the image of the same Almighty God,” it states. “As we write the next great chapter of our nation, we reaffirm our commitment to these fundamental truths and will work to ensure that all Americans live in a country where they feel safe and where their opportunities are limitless,” the letter states. While the correspondence was dated Dec. 21, Log Cabin Republicans just posted the letter to their Twitter account on Jan. 17. “Thank you to @POTUS @realDonaldTrump and @FLOTUS @MelaniaTrump for your kind commemoration of Log Cabin Republicans and best wishes for our future as we forge ahead, together, toward a more equal America,” the group wrote in sharing a photo of the letter. See the post in full here. This is not the first time that Trump had acknowledged homosexual citizens. As previously reported, during his RNC acceptance speech in July 2016, Trump told those gathered that he would work to protect homosexuals if elected. The Trump campaign website had additionally made “LGBTQ for Trump” t-shirts and pins available for purchase. “Show your pride and your support for Trump with this exclusive equality tee,” the store page for the t-shirt, available as the “Trump pride men’s tee,” read.